The assualt on the GPRC Wolves indoor track record book continued this weekend, as two athletes set three new marks at the Golden Bear Open at the University of Alberta Butterdome. 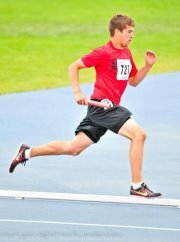 Joren Manz established new GPRC standards in the 300m (37.48-20th) and 600m (1:25.24-8th). In the 3000m, Hayden Hollowell (9:24.85 – 15th) and Eric Martinek (9:27.24-16th) both recorded personal best times. Hollowell’s time improved the GPRC school record by 13 seconds. Next up for the Wolves indoor track team is the ACAC Meet #1 next Sunday in Edmonton.